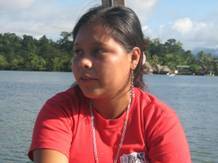 Sandra Marivel Pérez Pop became a GOJoven Fellow at age 18 and is a Mayan woman from Livingston, Izabal. She studied sustainable tourism at the Ak Tenamit Association. Sandra worked as a volunteer for an AIDS prevention project where she traveled with a group of clowns to rural communities and to Livingston to teach the population about the importance of HIV prevention. Sandra was invited and awarded a grant to represent Guatemala in an International Conference on Women and HIV in Kenya, Africa to share her experiences from Izabal. Sandra wants to continue to uncover in the field of counseling and community work on HIV and hopes to study psychology in the future.